I just bought a used coach equipped with dual auxiliary batteries. I used my voltmeter to test them and only got a reading of 8.5 volts. When I checked the cells I found they all were almost dry. I refilled them all with distilled water and plugged in my outside power cord to allow a trickle charge. I checked the battery readings every day for three days and the readings were still routinely 8.5 volts. Today when I pressed the AUX button on my panel, all five indicator lights came on to the “Full Charge” indicator. I tested the batteries again and they all registered 8.5 volts. I flipped the auxiliary battery switch to “On” with the outside power still connected and immediately heard a humming sound coming from the battery compartment. When I leaned down over the battery storage compartment I also heard a sound like boiling water and there was a strong nauseating odor. I tested the batteries again while this was occurring and they tested at 13 volts. I turned the auxiliary battery switch to “Off” and again tested the batteries, which were back at 8.5 volts. I turned the switch to “On” again and it hummed, sounded like boiling water with the same odor and tested at 13 volts. Yet when turned off, they tested at 8.5 volts again. The two utility batteries are Group 24 Marine/RV batteries. Is this normal or do I have a problem? Are there specific procedures for checking and recharging utility batteries? —Ken V.
First of all, in order for the onboard converter/charger to actually charge the battery bank, that auxiliary battery switch must always remain on or “Connected.” It is apparently a battery disconnect switch – typically used during periods of non-use. It basically takes the battery out of the system altogether, including the charge current coming in as well as the battery current going out. But it is quite possible you have more than one problem: a battery charger problem, a miswired battery bank or, since we don’t know their true condition, simply faulty batteries. A process of elimination will determine the culprit, but it’s obvious the batteries probably suffered some damage just by being boiled dry. 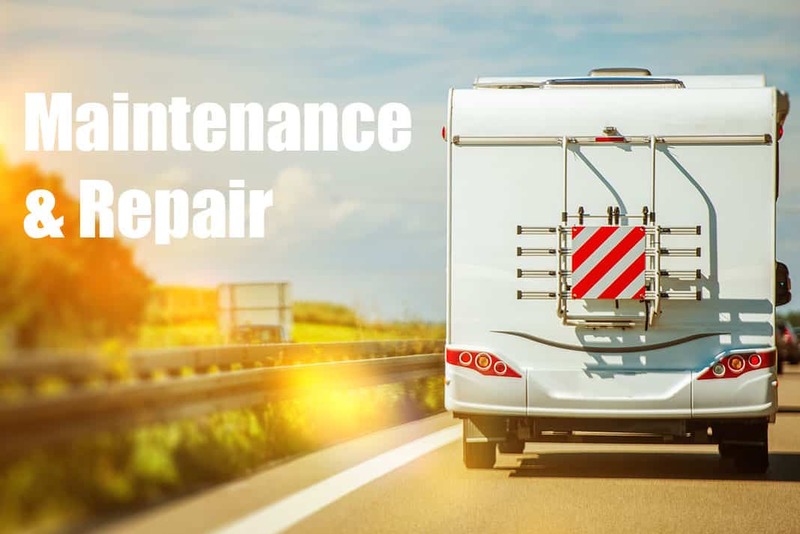 The first thing pro RV service techs do is eliminate the battery bank as the cause of the problem. It may be time to have a tech fully test them by using a carbon pile battery load tester. Not usually found in the DIYers tool kit, a carbon pile battery tester will reveal internal battery problems not normally detected by simple voltage measurements. But here’s what’s probably happening. The batteries are definitely dead and may be sulfated and damaged beyond rescue. But since the battery bank is removed from the circuitry by virtue of the battery disconnect switch being off, you are actually measuring the converter/charger voltage at the monitor panel while the motorhome is plugged into shore power, not the actually battery voltage. When you turn on the disconnect switch (bringing the batteries back into the system), the converter/charger is suddenly tasked with trying to charge two completely dead batteries. Since you added water to the electrolyte, the sulfuric acid content is very low in each cell and the charger is trying to pump as much current at the highest voltage it can into those dead batteries. The off-gassing (bubbling and odor) are the result. The first step would be to fully charge them prior to having a carbon pile test performed. If possible, disconnect the batteries from the RV charging system and charge them both independently using a shop battery charger. Of course, if during the off-line battery charging process it’s discovered that both batteries simply will not take a charge, then we can probably assume they are internally sulfated beyond resuscitation and it may simply be time for a new battery bank. But if they indeed begin to accept a charge (meaning the open circuit voltage and the specific gravity gradually increases) under a low charge rate, they may still be salvageable. Completely dead Group 24 batteries, though not huge in terms of battery capacity, may still take a few days under a slow/low charge rate to fully charge. Here’s how to determine when any given battery is fully charged. While charging, monitor the specific gravity in each cell using a temperature compensated hydrometer. As the battery continues to accept a charge, the specific gravity will continue to rise. At some point the specific gravity simply will stop increasing. When it refuses to keep escalating in all cells after a two- or three-hour period, that battery is indeed fully charged. It simply will not store any more amp-hours. By the way, if there is a difference of .050 points between any two cells on the same battery when using the hydrometer, that battery is indeed faulty and should be replaced. Test over! Once the batteries are each fully charged, have them tested on a carbon pile load test. Some RV shops may not be equipped with a carbon pile tester (though they indeed should), but you can also have this service performed by any independent battery retailer. If the batteries indeed become fully charged and they pass the carbon pile test, next, be sure they are reinstalled and wired correctly. Two 12-volt batteries are wired in parallel to double the storage capacity yet still remain at 12 volts output. Be sure the “hot” wire from the RV charging system is wired to the positive post of one of the batteries and that the negative ground wire is connected to the negative post of the other battery and to a good, clean and dry connection on the coach frame. I wouldn’t put too much faith in the onboard battery meter on the monitor panel. Rely on a good volt-ohmmeter (VOM) for more accurate measurements. I recommend every RVer carry a decent digital VOM anyway. This leads me to the third possibility: the condition of that onboard battery charger. Depending on the brand and model, some less expensive converter/chargers have a propensity to overcharge batteries, hence the condition you found the battery bank in originally. There are much better chargers available that may be a better choice. And you always have the option to upgrade. But with shore power connected, the battery switch activated and the charger operating, you should measure an increase in the voltage at the batteries, above what the batteries measure in an open circuit situation. All this said, I’d wager the charger is probably okay, simply typical and mediocre, and that the batteries will fail one of the tests mentioned above. If I’m right, new batteries and an investment in a sophisticated, chip-controlled RV battery charger will probably eliminate your issue forever. If you opt to keep the current charger, be sure to monitor the electrolyte level in the batteries often while the coach is connected to shore power. I agree that the battery light indicators at the main panel inside the RV are about as accurate as the indicator lights for the gray/black tanks. How accurate is the voltage read on the leveling jacks control panel? Another informative, detailed, and easy to understand article. Thank you Gary and RVTravel. I’ve learned a lot from you folks. Mike’s are very educational also. Really appreciate it. With the description of the outgassing, I sure hope he was wearing full coverage eye protection! The outgassing contains explosive fumes. Need to warn all about the dangers of that. Especially full coverage eye wear and sparks.